John A. Gaskins, a son of Harmon Gaskins and Melissa Jones and grandson of Fisher Gaskins, was born September 8, 1854 in Old Lowndes, now Berrien County, GA. In 1905, when John A. Gaskins was a gentleman of 50 years, the Tifton Gazette noted as a human interest item that he had been thrown by his mule. He was treated by Dr. Pleasant H. Askew of Nashville, GA.
John A. Gaskins thrown by a mule. 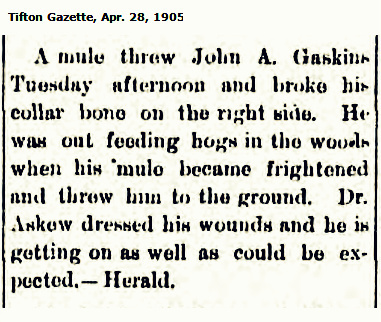 A mule threw John A. Gaskins Tuesday afternoon and broke his collar bone on the right side. He was out feeding hogs in the woods when his mule became frightened and threw him to the ground. Dr. Askew dressed his wounds and he is getting on as well as could be expected. -Herald. The item was newsworthy in part because the Gaskins were prominent Wiregrass land owners and cattlemen. They were one of the early pioneer families of Berrien County. The patriarch, Fisher Gaskins, and his sons Harmon, William and John, had originally settled on the west side of the Alapaha River, near present day Bannockburn, GA., about 16 miles distance from today’s Ray City, GA location. Harmon Gaskins, and his brothers William and John, were among Captain Levi J. Knight’s Company of men who fought in the Indian Wars of 1836. Just a year before John A. Gaskins’ mule bolted, in 1904, the papers noted that he had closed a big timber deal. The transaction was for 3,400 acres of timber to be cut at a sawmill on the Ocilla, Pinebloom & Valdosta railroad. Nashville, GA. Feb. 12. 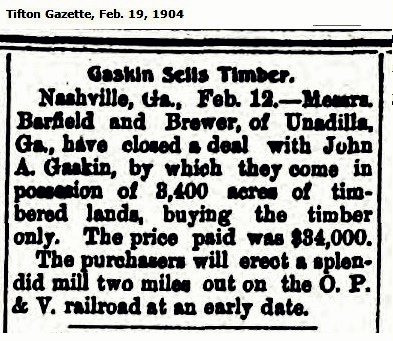 – Messrs. Barfield and Brewer, of Unadilla, Ga. have closed a deal with John A. Gaskin, by which they come in posession of 3,400 acres of timbered lands, buying the timber only. The price paid was $34,000. The purchasers will erect a splendid mill two miles out on the O.P. & V. railroad at an early date. John A. Gaskins grew up at his father’s homestead near Five Mile Creek, about six or seven miles northeast of present day Ray City, GA.. John’s mother died when he was about 10 years old, and his father remarried to Mary McCutchen Jones, widow of Matthew Jones. In 1877, John A. Gaskins married Mary Elizabeth Bostick. She was born 1859, a daughter of Sarah Ann Knight and Jesse S. Bostick . When Mary was about three years old in 1862 her father enlisted in the Clinch Volunteers, which mustered in as Company G, Georgia 50th Infantry Regiment. His Regiment was involved in some of the bloodiest fighting of the Civil War at the Battle of South Mountain and at the Battle of Cedar Creek. He was taken prisoner and spent the rest of the war in the POW camp at Point Lookout, along with fellow POWs John T. Ray, Benjamin Harmon Crum, Benjamin T. Cook and Aaron Mattox. Just a year after Mary’s father marched off to the Civil War, her mother died of measles. When the War ended and her father returned home, he married Mrs. Nancy Corbitt Lastinger. She was the widow of James G. Lastinger, who served in the 29th Georgia Regiment (with the Berrien County Minute Men) and died in a Union hospital in 1864. Thus, Mary Elizabeth Bostick was raised by her step-mother Nancy Corbitt Bostick. In 1827, eighteen-year-old Bryan J Roberts arrived in the newly created Lowndes County, GA with his parents and siblings. His father, John Roberts, settled the family on a plot of land situated near the Cat Creek community, eventually establishing a large plantation there. Bryan J Roberts 1809-1888. Cat Creek Cemetery, Lowndes County, GA. According to Folks Huxford, Bryan J. Roberts was born in Wayne County, GA on June 4, 1809, a son of Phoebe Weeks Osteen and John R. Roberts. In Lowndes County, on January 26, 1832 Bryan J. Roberts married Wealthy A. Mathis (1813 – 1888). As a young woman, she had come from Bulloch County, GA with her parents, Rhoda Monk and James Mathis, to settle at the site of present day Cecil, GA in Cook County. John Jackson Roberts (1832 – 1907), married: (l) Susan Vickers daughter of Lewis Vickers; (2) Mrs. Catherine Gaskins widow of John Gaskins of Coffee County. James W. Roberts (1834 – 1900), married Elizabeth “Eliza” Edmondson daughter of David Adam Edmondson . Mary Ann Roberts (1835-1919), married Archibald Duncan Wilkes of Berrien County. 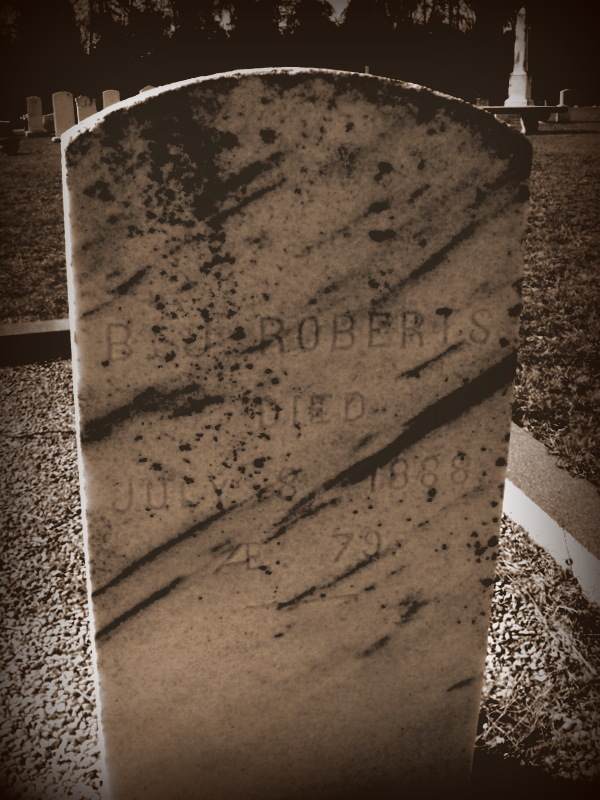 Stephen N. Roberts (1837 – 1863), never married; joined the Berrien Minute Men in 1861 and served at Brunswick, Sapelo Island and Savannah; died of pneumonia January 6, 1863 in Lowndes County, GA; buried at Owen Smith Cemetery, Hahira, GA.
Jemima Roberts (1839-1913), married William H. Burgsteiner son of John R. Burgsteiner. Rachel Roberts (1841-1867), married Jacob Dorminy son of John Bradford Dorminy, Jr. of Irwin County. Nancy Roberts (1843- ), married William S. Phillips of Stockton. Warren H. Roberts (1846-1908), married: (1) Virginia S. “Jennie” Edmondson daughter of Rev. John Edmondson; (2) Isabella Strickland, daughter of Charles Strickland. William K. Roberts (1847-1908), married Phyllis McPherson Oct 27, 1888 in Berrien County, GA.
Elizabeth “Betty” Roberts (1851-1933), married Daniel D. Andrew Jackson Dorminy, son of John Bradford Dorminy, Jr. of Irwin County. Martha Roberts (1854-1898), married Frank Moore son of Levi Moore. 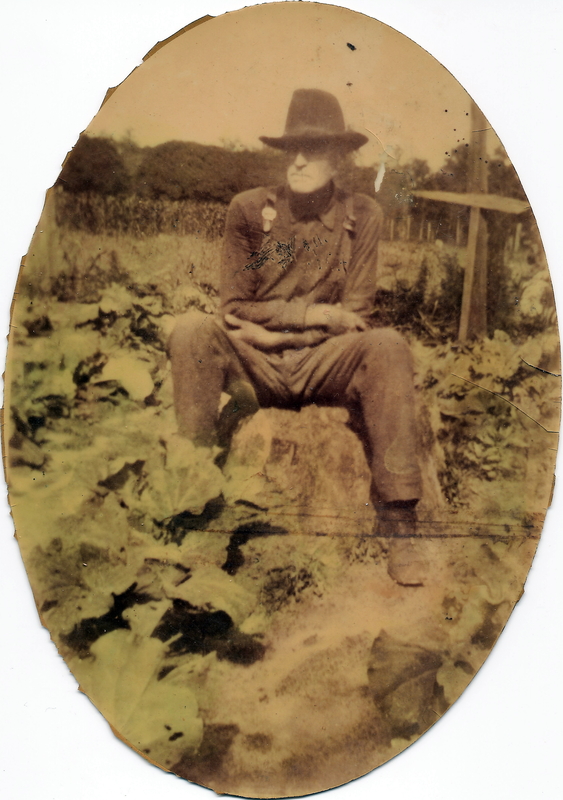 From 1827 to 1829, Bryan J. Roberts served as an ensign in the 663rd district of the Lowndes County militia. He was elected Justice of the Peace in the 658th district, Lowndes County, for the 1834-1837 term. He served in the Indian War of 1836-1838 as a private in Captain Levi J. Knight’s company of Lowndes County militia, and was one of those present at the skirmish with Indians at William “Short-arm Billy” Parker’s place preceding the Battle of Brushy Creek. Prior to his death, Bryan J. Roberts divided his property among his children. This “self-administration” of his estate was reported in The Valdosta Times, August 8, 1885. Mr. Bryant Roberts is 77 years old, and he moved to this county in 1827. He has reared 10 children and there are numerous grand-children. The old gentleman lost his wife last year, and since that time he has been lonely at the old homestead. Last week he summonsed all his children together and made up and inventory of all he owned. It footed up $10,000. Six thousand of his property was divided up into ten equal parts, and each child drew for his or her share. The old gentleman reserved $4,000 for his own use for the balance of his life. The homestead was included in the property divided, and the old gentleman will break up housekeeping and spend the remainder of his declining years around among his children. Mr. Roberts has taken this step because he feels that the silken cord has weakened under the weight of years and he prefers to be his own administrator. We trust his children will make it pleasant for the old gentleman during the remainder of his sojourn with them. According to the above newspaper clipping, Wealthy Mathis Roberts died about 1884. on July 8, 1888 Bryan J. Roberts followed her in death. They were buried at Cat Creek Primitive Baptist Church.